The 4th International Soft Matter Conference (ISMC2016) was held at the centre Alpes-Congrès at Alpexpo Grenoble, from 12th to 16th September 2016 under the auspices of the SoftComp consortium. Three previous conferences were held in Aachen (2007), Granada (2010) and Rome (2013). 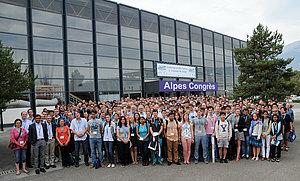 Over those five sunny days in Grenoble, the conference has brought together nearly 700 experimentalists and theorists working in the soft matter field of which more than 200 students. Thirty-seven different nationalities were represented. With 8 plenary and 21 keynote lectures, 116 contributed talks (selected from 800 submitted abstracts) and 480 posters, the conference has covered both the fundamental and applied aspects of soft matter and complex systems. Local organisers of ISMC2016 have included scientists from the large-scale facilities ILL and ESRF as well as from the Grenoble University and other research organisations such as CEA, CNRS, and INPG. 36 sponsors among institutions and private companies have allowed a smooth running of the programme with reasonable financial impact on the participants. The sponsorship received was very successful as compared to previous editions. In total 14 industrial companies presented themselves with booths in the central exhibition area and 6 industrial sponsors enriched the programme with the organisation of lunch seminars. Overall, as underlined by many of the participants, the conference was a great success in terms of quality of scientific contributions, technical organisation, possibilities for discussions and exchanges, rewarding three years of hard work by the local organising committee. See also article on the American Physical Society website.